Indian pugilists broke new barriers and created history at the 2013 AIBA World Boxing Championship in Almaty, Kazakhstan on Tuesday (22 Oct 2013), with five of them booking a spot in the final 8 of their respective weight divisions. This is the first time ever that five Indian have qualified for the quarter-finals of the World Boxing Championship. In the previous edition of the event India scored its highest number with four making it onto the round of 8, but this time the Indian boxers have gone one up and created a new record. 2012 Asian Continental Olympic Qualifying gold medal winner Sumit Sangwan (81kg) along with reigning National Champions Vikash Malik (60kg) and Satish Kumar (+91kg) joined their compatriots Manoj Kumar (64kg) and Shiva Thapa (56kg) in the QF run, to complete the extraordinary feat. All five are now just a win away from a bronze medal performance. Vikash was the first Indian to take to the ring on the secondday of the pre-quarter finals. Up against the fifth seed and 2008 European Championships silver-medallist Miklos Varga from Hungary, the 26 year old made a solid start to take the early advantage. Following his aggressive style Vikash maintained the momentum throughout the nine minutes of play and went on to claim his place in the last eight of the light weight category with a unanimous decision. The stout railways boxer will have to bank on his aggressive intent to make it to the medals rounds too, as he takes on 2011 Pan-American Games silver-medallist Robson Conceicao of Brazil, who is seeded fourth in the competition. Sangwan was the second to follow as he pulverized 8th Seed Siarhei Novikau of Belarus in one-sided contest to cement his place in the final eight of the light heavy weight division. His clear cut jabs and sharp counters were the big difference and helped him win by a unanimous decision from the judges. The 20 year old will have an uphill task as he looks to upset London Olympics silver-medallist and top seed Adilbek Niyazymbetov of Kazakhstan for a place in the semi-finals; Niyazymbetov also won the silver medal at the 2011 WC. Heavy weight boxer Kumar also joined the party as he beat Yan Sudzilouski of Belarus in a well played out bout. The burley 24 year old stuck to his guns and did well to stay ahead throughout the entire duration; he won by a unanimous decision as well. In the quarters he will lock horns with local lad and London Olympics bronze-medallist Ivan Dychko. 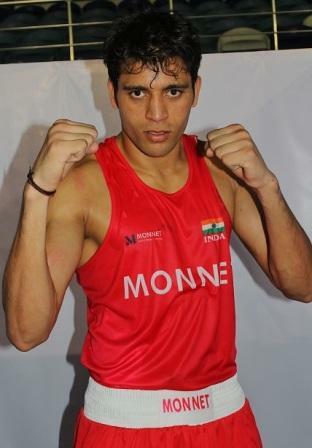 Earlier in the tournament two times Asian Championship bronze medallist Manoj Kumar (64kg) defeated Yves Ulysse of Canada to book his quarter-final spot. He is slated to box Yasnier Lopez of Cuba in the round of eight. Asian Champion Shiva Thapa (56kg), who was the first to advance into the quarters, outpointed Argentina's Alberto Melian and will now look to overhaul Javid Chalabiyev of Azerbaijan. All five boxers are now just one step away from winning their first world championship medal. Only two other Indian boxers have had the distinction of winning a WC medal; Beijing Olympic bronze medallist Vijender Singh was the first Indian to break the barriers in 2009, while Vikas Krishan followed suit in 2011. Both the boxers won a WC bronze medal.